Happy Friday! Since I've been slacking on the cooking recently, I figure I should post some recipes and tips until my schedule slows down. 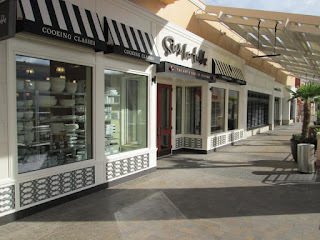 Sur la Table just opened their first store in San Diego this week! I was just there 7 weeks ago for a work conference and fell in love with the city. Below is a Surf and Turf Recipe from their resident chef. Instead of poaching the shrimp, we've wrapped these in thin slices of prosciutto and roasted them in the oven. The bright green dipping sauce lends a festive look to the presentation of this updated appetizer. The dipping sauce can be made up to 2 hours ahead. Preheat oven to 425°F and place racks in the upper and lower thirds. To prepare shrimp, wrap each shrimp with one prosciutto strip. Place seam-side down on a prepared baking sheet. Transfer pans to preheated oven and roast shrimp, turning and rotating pans halfway through, until shrimp is opaque, about 10 to 12 minutes. Remove pans from oven and allow shrimp to cool. To prepare basil dipping sauce, place basil, parsley, garlic, and oil in a food processor fitted with a metal blade or a blender and puree until smooth. Scrape basil mixture into a medium mixing bowl. Using a silicone spatula, fold in mayonnaise, mustard, and lemon juice until thoroughly combined. Taste and adjust seasoning with salt, pepper, and drops of additional lemon juice as needed. Set aside. Turf: Rosemary Rubbed Flank Steak with Romesco Sauce Romesco is classic sauce from Catalonia, Spain, that typically includes finely ground tomatoes, red bell peppers, onion, garlic, almonds and olive oil. We've given this version a twist by using walnuts in the sauce. Preheat oven to 150°F and place a rack in the center. Set a wire cooling rack over a rimmed baking sheet and place in oven. Remove steaks from refrigerator and allow them to come to room temperature. To prepare Romesco sauce, place 3 tablespoons olive oil in a medium skillet and heat over medium-high heat until hot but not smoking. Add garlic cloves to pan and toast until golden, about 2 minutes. Remove garlic with a slotted spoon or spider and transfer to the bowl of a food processor fitted with a metal blade. Repeat with roasted red pepper, chiles, bread cubes, and ¼ cup walnuts, toasting each individually and transferring to the processor. Add vinegar to the skillet and deglaze, scraping up any browned bits with a wooden spoon. Pour vinegar mixture into processor and blend until smooth. Add remaining ¼ cup walnuts and raisins and process to a thick, smooth puree. Turn processor off, taste, and season with salt and pepper. Set aside. Pat steaks very dry with paper towels. Rub steaks with 2 tablespoons olive oil to lightly coat all sides and season them generously with salt and pepper. Rub the steaks all over with chopped rosemary, pressing to adhere. Heat the remaining 2 tablespoons oil in a large skillet over medium heat until hot but not smoking. Carefully place steaks in the skillet one at a time and sear until well browned and cooked to medium-rare, about 3 to 4 minutes per side, flipping once. Using tongs, transfer steaks to the wire rack in the oven to keep warm. To serve, place steaks on a cutting board with a well. Using a sharp slicing knife, cut steaks into ½-inch thick slices. Divide slices between 8 warmed dinner plates. Top with a generous dollop of Romesco sauce and serve immediately. I stopped by your blog after finding you via Pinterest (you had pinned a photo of my kitchen) :) I just wanted to say I am loving reading your blog and perusing all the yummy recipes. Thanks for sharing these! I will definitely be bookmarking several!